SCVHistory.com LW3246 | William S. Hart | Lobby Card: 'The Disciple,' 1915 (1923 Re-release). 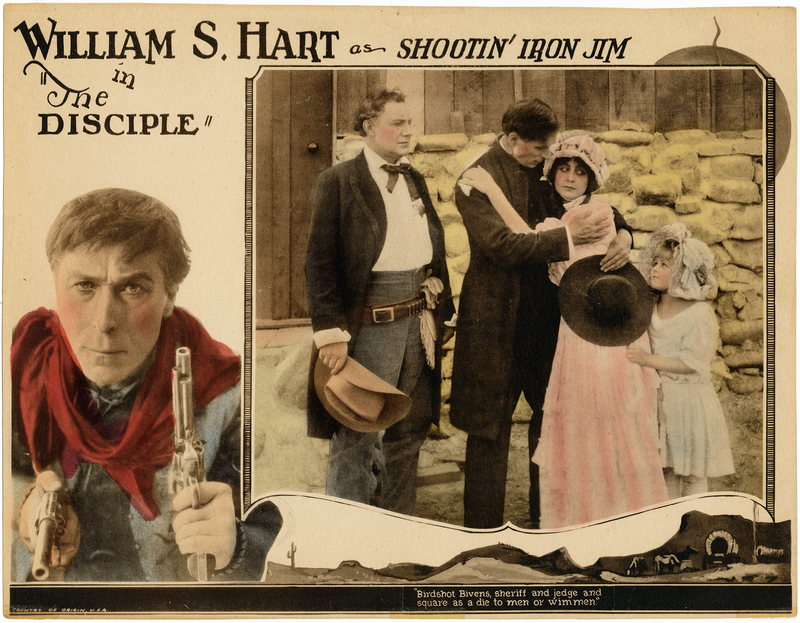 Lobby card advertising William S. Hart as Shootin' Iron Jim in "The Disciple" from Kay-Bee Pictures, originally distributed by Triangle in 1915. The card measures approx. 10¼x&13¼ inches and has been cut down from the original 11x14 inches — which is unfortunate, but only the white border is missing. It doesn't come right out and say so, but this lobby card tells us in other ways that it is from the 1923 theatrical re-release from Tri-Stone Pictures. Here's how we know. Lobby cards were 8x10-inch black and white photographs until about 1919, when they switched to 11x14 inches. (What makes something a lobby card is the fact that it was intended to be pinned to a cork or fabric-covered board in a movie theater to advertise "coming attractions" or "now playing.") While black-and-white stills continued to be published after 1919, they usually weren't lobby cards, but rather publicity photos for use by newspapers and magazines. When lobby cards switched to 11x14 after World War I, they were monochrome lithographs, usually sepia or blue, on buff-colored cardstock. Around 1921-1922 we see the first four-color lobby cards. They were lithographs of hand-tinted BW photographs (the same photographs used in the publicity stills), sometimes with original artwork around the borders. Tinting and printing techniques improved over the years, but lobby cards continued to be lithographs of hand-tinted BW photographs through the 1940s and 1950s. By the 1960s, lobby cards usually used true four-color photographs as their underlying image. So, here we have a hand-tinted 11x14 lobby card for a movie made in 1915, when it should a black-and-white 8x10. The underlying photographs are hand-tinted in watercolor, the technique used with the first colorized lobby cards in the early 1920s. Finally, a lobby card from the original 1915 release would include the name of the distributor (Triangle) and sometimes the production company (Kay-Bee); this does not. Tri-Stone's 1923 re-release of "The Disciple" is a perfect fit. Who cares? William S. Hart cared, that's who. This lobby card is a testament to everything that was wrong with the motion-picture business in the late 1910s-early 1920s, and the thing that turned Bill Hart into a severely embittered individual. By 1917, Hart had gone over to Adolph Zukor and Paramount. Thomas Ince was always struggling with his Triangle Film Corp, and in 1917 some ... enterprising entrepreneurs, at best, and unscrupulous bastards at worst ... formed new distribution companies, one of which they called "W.H. Productions" (for obvious reasons), and bought up Triangle's old film stock, re-edited it, and re-released it. "Tri-Stone" was one such company, and its 1923 re-release of "The Disciple" is one of many examples of a release for which the real "W.H." didn't see a dime. There was no such thing as movie residuals in those days, and little in the way of profit sharing. Just contract salaries. Hart would sue a number of people over this sort of thing. His most famous lawsuit involved the alleged breach-of-contract on the part of United Artists to suppress the original 1925 release of "Tumbleweeds." It ended his film career. The only good thing about it was its effect on posterity and, ironically, William S. Hart's legacy. Triangle's film stock was worn out after having played so many times in the 1910s. Many Hart films would not exist today if not for the profiteers of the 1920s who made fresh prints. "The Disciple" is one of these. For a detailed account of all of this, read Kalton C. Lahue's "Dreams for Sale: The Rise and Fall of the Triangle Film Corporation" (1971). LW3246: 9600 dpi jpeg from original lobby card purchased 2018 by Leon Worden.